Why can’t this comic be published on a more regular basis? Jonathan Hickman once again delivers a stellar issue of his enigmatic, intricately plotted Secret, and this issue sheds more light on the conflicts Hickman’s been building over the past three issues. Plus, we finally find out what “Kodiak” is and the answer adds a whole new level tension to Grant’s situation. Hickman’s pacing in the issue is stellar, particularly the build up to the end. He crafts a tightly knit tale that oozes suspense, and the shifts in narrative focus only aid this. This is the definition of a page turner, and the back and forth conversations between characters help the flow so that the story moves along at a quick clip, catching the intensity Hickman is going for. And really, the reason the issue works so well is because of Ryan Bodenheim and Michael Garland. Bodenheim’s work has never looked sharper, particularly in the close ups (which also go far to help build the anticipation). Lush inks, fine pencils, and crisp detail all work together to crate a series of detailed drawings that give the comic a cinematic quality. I still cannot figure out Michael Garland’s color scheme, but this is where the imagery comes to life. The skilled composition of the pages is due to Garland’s work, and what he does with Bodenheim’s illustrations. The tension exists in Hickman’s story, and while Bodenheim creates it visually, Garland executes it with precision. The artistic team on this book – from writer, to illustrator, to colorist – is worthy of admiration for its continuously excellent work. 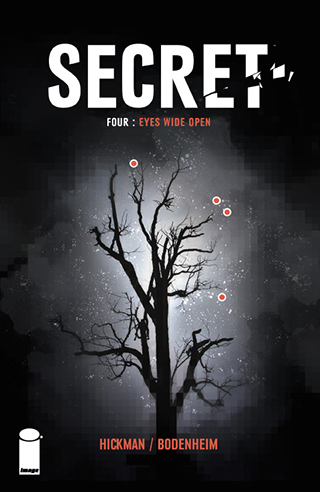 Each issue of Secret is better than the last, and my only complaint about the series is its erratic publishing schedule. When Secret delivers, it does so with aplomb. Knowing that we have to wait so long to find out how Grant reacts to Kodiak’s revelation is frustrating, but if the past four issues are any indication, the results will be spectacular – both in its story and visuals. Matt Murdock and Kirsten McDuffie have been playing the “is he/isn’t he” game long enough, so I’m glad that Waid finally came out and ended the mystery of Matt’s secret identity as the blind vigilante Daredevil. The lead up to this, a series of panels in which Matt jogs backwards next to McDuffie, showing off his abilities as Dardevil, are superb. The sequence is funny, clever, and illustrative of Waid’s ability to be creative with one of the most common tropes of the superhero genre: the hero’s reveal to the love in his life. The rest of the issue is about the Sons of the Serpent, a group of white supremacists who have infiltrated every aspect of government, and Matt’s attempts to lure them out into the public in order to usurp their power as a subversive entity carrying out its dark plans under the nose of innocent people. To this effect, Kirsten McDuffie plays the voice of justice, and her poignant moment – a speech about racism given to the people of New York – is a bit too saccharine and hokey. I appreciate it, but it’s heavy handed. The tension it builds, however, makes the climax of the comic a race against time as Matt attempts to protect Karen from an attempted assassination. His confrontation with her would be assassins, though, is pretty damn awesome as Matt has never really lost his cool – until now. Too bad we don’t see what he does, but his face is enough to let us know that these men won’t be walking right for a while. Javier Rodriguez’s art looks slightly different in this issue as the inks are a bit thinner. This isn’t a complaint, but a noticeable change from his usual work. The only major difference is that Matt looks more lithe than normal, but every issue is still impressively detailed. The quick shifts in focus in the final pages helps build the tension of the climax, and the sharpness of the colors (also provided by Rodriguez) give an energetic quality to the art, especially in the moments between Matt and Kirsten. 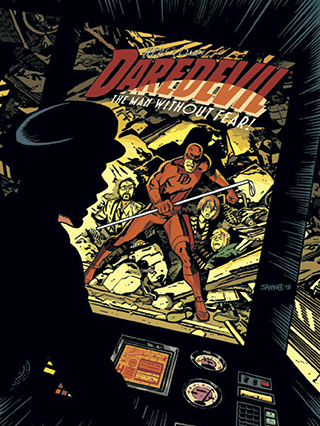 Daredevil is, without a doubt, one of my favorite books. I never got into the character until Waid starting writing him. I’m glad I did. This series is one of the best to hit the shelves each month, and while Waid occasionally makes his story into a treatise against social injustice, the tone he’s established makes the comic work so that it doesn’t come across too preachy. Plus, Matt Murdock is blind a man obsessed with justice, so should we expect any less? Bannen’s Book of the Week: One might think that the quality of a series initially entitled Batman and Robin might dip when one of its title characters died, but in the months since Damian’s demise, Peter J. Tomasi has been at the top of his game, making each issue of Batman and Robin a must read. The most recent arc, involving Two-Face and Irish mobster Erin McKillen, has been one of the best of the series so far. 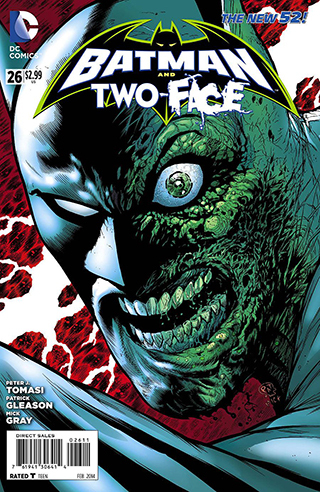 Batman and Two-Face is split into a three act structure – first Bruce’s less than pleasant evening with Erin, then the history between Harvey Dent and the McKillen sisters and finally Erin and Two-Face’s show down regarding her role in Harvey’s wife’s death, and his grotesque scarring. The first act is solid as Tomasi shapes the tension between Erin and Bruce with impressive skill, particularly in how he uses Alfred’s disgust of Erin as a form of comic relief. Their past history is explored, and one can see how in a different world, Erin and Bruce might have ended up together. But the second act is the bread and butter of the issue, filling in the gaps as to why Erin McKillen hates Harvey Dent so much, and where Erin’s sister Shannon disappeared to. I ended up sympathizing with Erin. She’s crass and violent, but by the end of the issue, she’s humanized in a way that makes rooting against her difficult. It’s a shift in perspective that caught me off guard, and one that shows Tomasi’s skill as a writer. The final moments of the issue, which take place at Gilda Dent’s gravesite, are where Tomasi ties all of his threads into a compact and action heavy climax. The pacing is so tight that the end of the comic feels abrupt, but I don’t say this is a fault with the writing, only an example of how quickly the action moves. And what can I say about Patrick Gleason except that he’s brilliant. There’s a thoughtfulness behind each illustration, an attempt to build characterization and subtext, and one that is executed so effectively that its worthy of note. Tomasi’s story is damn good, but having Gleason on board with the art elevates the tale into another echelon. It’s great that DC has so many solid Batman titles right now. Between Scott Snyder’s Batman and Peter J. Tomasi’s Batman and Two-Face, Dark Knight fans have a lot to look forward to every month.